Meghan Markle’s story, from her days of humble beginnings to becoming a British Princess, has inspired hope in a lot of people, including Toke Makinwa, and the TV personality has advised women using an old photo of the new Duchess of Sussex. The photo in question, is one of a 15-year-old Meghan sitting in front of Buckingham Palace while on a vacation to the UK. There was no way Meghan would have known at the time that she would one day be a part of the family that lives in that palace. After the photo was taken, Meghan went on to become a glamour model, an actress, and then got married, and divorced soon after, before she met and married Prince Harry. 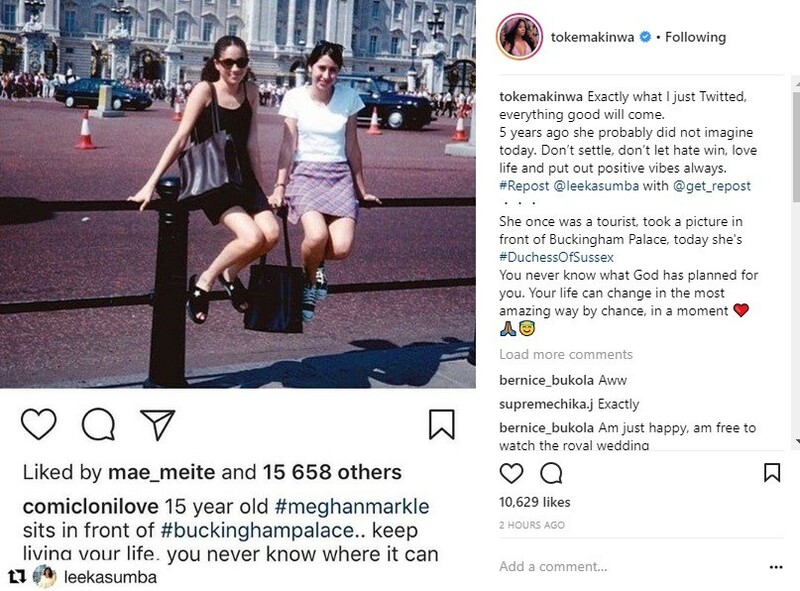 Sharing a photo of Meghan at 15 in front of Buckingham Palace, Toke advised women never to settle because they never know what God has planned for them and their lives could change in the most amazing way. Read what Toke wrote below.